On this episode of The Innovation Engine, we talk the (underutilized) power of listening. 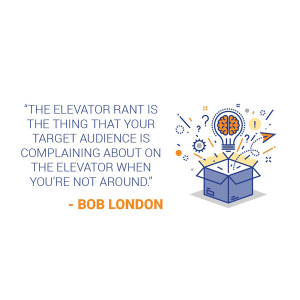 Our guest, Bob London, shares why listening is such a powerful tool in a world that won’t stop talking, key questions you should ask when you get the opportunity to talk to customers, and why you should – metaphorically, at least – burn the white board. Bob is a pioneer in the marketing world – he created the outsourced Chief Marketing Officer concept more than a decade ago – and now he’s out to change the world by evangelizing the incredibly valuable insights that come from something shockingly simple: listening to the customer. Bob serves as an entrepreneur in residence at the University of Maryland’s Dingman Center for Entrepreneurship and he is an international mentor at 1776, the global startup incubator. Why is listening such an important tool for any business leader today? As business owners or executives, sometimes we don’t know what we don’t know – but one of the the antidotes to learning what you don’t know is asking the right kind of open-ended questions. Asking your prospects and customers the right questions in the right way yields a lot of insights. So the elevator rant is the real stuff that people are saying about you (and it doesn’t have to be bad), and that tongue-in-cheek idea turned into a series of insights. Again, if you ask your customers and prospects the right questions in the right way – and listen – you will learn things that they haven’t shared with other vendors because those other vendors haven’t asked those questions. Once you have the rant, you can use it to preface your pitch to make it a lot more engaging and informative. How can we get to know our customers (and our customers’ elevator rants)? A series of human-to-human conversations, by phone. It’s not an interview and it’s not a survey – it’s a one-on-one conversation. A leader in an organization should set up phone conversations with a minimum of five, but hopefully 10, decision makers that are either existing customers who know the company really well or are prospects that are in the target audience but don’t know much about the company. What are your company priorities for the next one to two years? If I stop someone in the hall and ask them what they’re working on, what should they be saying? It should probably fall into one of three big buckets, in terms of mission and priorities. What do you wish you were doing better in any of those areas? Does our industry have a reputation – good or bad? In other words, if you get a cold call from someone who’s in our industry, whether it’s us or not, what do you think? Will: [00:00:00] Welcome back to the Innovation Engine podcast. On this week’s episode we’ll be talking about the power of listening with Bob London. Among the topics we’ll discuss are why listening is such a powerful tool in a world that won’t stop talking, key questions you should ask when you get the opportunity to talk to customers, and why one man thinks you should (metaphorically at least) burn the white board and get up there and talk to people. Joining me today to talk about those topics and more is Bob London. Bob is a pioneer in the marketing world, having created the outsourced Chief Marketing Officer concept more than a decade ago. Bob has worked with, advised, and mentor to hundreds of businesses to develop marketing strategies by first learning the customer’s true perspective. He serves as an entrepreneur in residence at the University of Maryland’s Dingman Center for Entrepreneurship, and is an international mentor at 1776, the global startup incubator. Bob is a frequent speaker and writer on topics related to his passion, the incredibly valuable insights that come from something shockingly simple: listening to the customer. Welcome to the podcast and to the studio, Bob. Bob: [00:01:18] I’m sorry I wasn’t listening, Will, what are you saying? Bob: [00:01:21] That’s a standard joke. Thank you so much for having me. I appreciate it. Will: [00:01:25] Absolutely we’re thrilled to have you here, in person no less. Will: [00:01:30] So set to kick things off today let’s talk about the lost art of listening. This is a podcast after all. Will: [00:01:37] Why is listening such an important tool in any business leader’s bag today? Bob: [00:01:42] So a couple of things. And this is based on my experience over the last six years or so when I became kind of a reformed marketer and someone who recognized that the best marketing strategy came from listening first and so there are a couple of things. First of all we don’t as business owners or CEOs or executives sometimes we don’t know what we don’t know – and I know that’s a cliche. But one of the the antidotes to learning what you don’t know is by asking the right kind of open-ended questions of your customers and prospects. Sometimes it’s customers of deals you lost. You call them up and say you know can we just chat, and asking questions, and the right questions in the right way, yields a lot of insight. It’s stunning to me how many times I’m involved with a company that thinks one thing. Now to their credit, they’re curious about whether they are correct. And then we go out of the market and the market says something very different. That’s kind of the essence of it I guess. The other asterisk is when you go out and do this kind of you know whether it’s a listening tour or just you know talking to one or two customers, you know it’s different. In other words everyone’s out there trying to make some noise and get noticed. And that’s the sort of mutually assured destruction aspect of marketing that we can’t all get our message across, and each tweet each new e-mail each phone call that we get, that companies make, is another brick in the wall of noise and there’s… On the other side of that wall there’s a customer. Listening is actually a way to disarm people to say no no I don’t want to talk about what we do – I want to find out more about you. So those are probably the biggest, most powerful aspects of listening. Will: [00:03:28] Sure. So I think it’s safe to say that anyone who’s listening to this podcast has heard of the elevator pitch. You’re big on uncovering something that you call the elevator rant. What does an elevator rant, and beyond listening, how do you recommend that people find out what their customer’s elevator rant or rants are? Bob: [00:03:48] I’m glad you asked. The elevator pitch can be a very important and effective tool. I’m just not a believer… based on my experience, I don’t believe that someone an expert or consultant or someone or someone inside the company says we need an elevator pitch – we need a better elevator pitch. What does that mean? It means that someone maybe in marketing or product management is going to write down a little mini script and then that gets distributed around the company. Everybody gets it, whether you’re in H.R. or sales or marketing, and when you’re at a quote unquote cocktail party you get to recite this script, and of course it sounds very forced and you know kind of hollow. And I really rejected the idea that people should focus so much on the elevator pitch before they understood what I called, jokingly at first, the elevator rant. That’s the thing that your target audience is complaining about on the elevator when you’re not around. So they talk about it in real raw language to each other. In other words, peer to peer. They’re talking about it before they met with you meet with you or after they just met with you, or they’re just talking about it at a conference. It’s the real stuff that they’re saying. And eventually that tongue in cheek expression of the elevator rant turned into something that actually was a… it was sort of a series of insights. Like they will actually reveal, customers and prospects, if you asked them, again, right questions in the right way and listen, you will pick up things that they haven’t shared with other vendors because those other vendors haven’t asked the right questions. So the elevator rant is the thing that, and I want to just clarify, it doesn’t always have to be a rant that’s a negative – but it’s the ‘I wish we could’ Or ‘why is it so hard to do this?’ So that’s that’s the concept. And once you have that, then you use it to preface your pitch. So in other words, if I said to you I’m a marketing consultant you might say OK. But if I start out by saying you know how a lot of consultants and companies say they can help you cut through the noise? And you might say Yeah, and I’ll say well a lot of times you may notice that after six months you’ve ended up just kind of contributing to the noise. I’m the type of consultant that insists that my companies my clients listen first to the market, or help I’ll help them listen, and then we can craft the value proposition messaging around that. And people go oh OK I get it. So it’s listening as a means to the end of doing better positioning and differentiation in messaging. So if you preface the pitch with the rant, it’s just a lot more engaging; it’s a lot less generic, less hollow, and more informative. Will: [00:06:31] Yeah. So you help you help people and companies be flies on the wall in their target organizations, or target customer organizations. Bob: [00:06:40] I guess that’s a good way to put it. Sometimes I’m the hired fly on the wall, but sometimes I coach them to do it and they’re very effective, at least the folks I’ve worked with are very effective at listening without going back to their own persona and interjecting and steering the conversation back to some sort of pitch. So that’s the key. Will: [00:06:56] OK. So there’s a famous quote attributed to Henry Ford that he never actually said, but it goes a little something like this and I’m sure you’re you’re with it: if I ask people what they wanted, they would have said a faster horse. So whether he’s said it or not, I think the spirit behind that makes sense and that the customer may not always be able to accurately voice the problems they’re having. How do you recommend leaders balance what they’re hearing from customers with the need to see around the corner and maybe envision what those customers will need, without them being able to verbalize it. Bob: [00:07:28] Right. The key there is, and I actually talk about that Henry Ford quote or I guess maybe it’s a mystery quote. You’re saying he didn’t actually say it which I I believe. That it really is up to us as leaders to hear what’s important and be able to prioritize and synthesize and interpret. So he heard… let’s say he heard people saying asking for a faster horse. He wasn’t in the fast horse business or he decided you know maybe they didn’t have steroids back then that whatever they could force them to make them faster. He said but I have this other thing that I’ve I’ve seen – it looks like a big opportunity – the combustion engine car, the assembly line, and all that. So I do get this question a lot like oh. So Bob you’re telling us whatever our customers say we should just do that. Absolutely not. We have to be. I was gonna say masters of our domain in the sense that when we hear something, we don’t filter it out by saying we could never do that. But what we say is Oh well what are they really telling us? What are they really telling us? And sometimes that can be solved during the conversation with a customer or prospect by saying “Tell me what you mean by that.” It’s an interesting example but I bought a car and I noticed that… So it happens to be a convertible I guess I’m having my midlife crisis. And in this seat near the headrest there’s a vent, and I didn’t really notice it. I didn’t really think about it at first but then I was sniffing around in the owner’s manual – so the vent is actually… heh. It’s called an air scarf, or a heat scarf. Bob: [00:09:00] Well I’m not trying to show off. I mean it’s… But the point is — and I haven’t used it — But the point is that I I thought oh I wonder what people said to that car manufacturer during their research to make them come up with this thing called a heat scarf, which blows warm air on you when the top is down in this car. And I I traced it back to someone must have said you know, if I had to guess, you know I like the idea of having a convertible but I live in an area like Pennsylvania where it’s cold a lot of the time. You know so I’m just not going to get a lot of use out of it. So the idea is well if you want to really enjoy the car more will give you a way to control the climate more inside the car when when the when the top’s down. So I think that’s kind of the gist of it. If someone says I want to use the car more – I’m not buying a convertible because I don’t think I’m going to use it that much, The top, then They’re not telling you to build an air scarf or heat scarf. You have to interpret that and be clever and understand. Or even go back to them and say well what do you mean – why can’t you have… ask an obvious question, why can’t you have the top down in October in Pennsylvania? Well because it’s cold. OK. Well when you say cold do you ever think of putting on more clothes when you drive? Yeah but that’s annoying… you know. So you just get into their head a little bit and then, but then it is our job as leaders to interpret and understand that. So I have two points there. One is you can get a lot of direction out of the conversations by asking these open ended questions and continuing to pursue what they said, instead of moving on to the next question or topic number one. But number two we’re all supposed to be experts in what we do for a living so it doesn’t matter if you’re a professional services firm or a product company, you’re hearing them and saying Ah I think this is what they really mean and then create something conceptually or like what you guys do in your… I think 3pillar has a stage called innovate or something along those lines where you’ll build a proof of concept for a company and help them test it in front of an audience. Bob: [00:11:00] I mean that’s that’s exactly what needs to happen. So you guys are actually built that into a product or service, if you will, to help address this exact issue. You can’t build a headscarf I assume here – if it’s a software product I’m sure you can help company. Will: [00:11:14] We can do a lot. We have not built head yet but never say never. It harkens back or Reminds me of an episode… I had a guy named Golden Krishna on and he talked about the plague of the phrase ‘there is an app for that.’ You know once mobile came along everybody just went technology crazy and they built apps for everything, and so the example that he put forward in his book wasn’t actually app related but it was wireless key injuries to a Mercedes. They built something that took like 12 steps for you to open the door of your car, whereas previously you had the hard key and put it then turned it and pulled the handle and it’s open. And that reminds me a little bit of the air scarf. But I guess we’re at a point where everything has been done it’s like… what’s novel these days? Bob: [00:12:04] Yeah I mean as I thought about it some more I thought about this scenario and I obviously you could tell I spent some time– I actually used it in a talk that I gave in a workshop as an example. But that OK is going to buy a car because of this heat scarf? That’s not what– they don’t go out looking for it because they probably don’t even know it exists. But I could imagine a couple in a dealership saying so let’s say it’s they’re looking at a Mercedes convertible and they they say what is that? It’s a heat scarf. What is it? Oh OK. So that would be nice when we go out to the mountains. I don’t know. Whatever they say. And then one other part in one of the spouses says Yeah I don’t think the BMW had that. So it’s just another reason for them. It’s a sticky thing that makes people go huh. So it could make a difference. But it’s certainly not a big game changer. But to your point about there’s an app for everything. One of the funniest things that I… and I haven’t gone shopping for it recently but… so I’m doing more talks and I bring my own wireless slide clicker because I want to make sure there is one and the batteries work. Bob: [00:13:10] And they make these things with… you would hope that there’s a forward button and a back button. Right. But there are all kinds of buttons on there. There’s the laser pointer which is fine I’ll give them that. But then there’s a volume control. There is a cursor button. There is something that if you press the button it goes to a black screen. So the reason I’m saying that is, when you’re a speaker, you’re not trying to hit the wrong button. So if there are 12 buttons on it, the odds of you hitting the wrong button are very high. And it’s just interesting to me that we do tend… I’m going to guess if they if the next wave of you know wireless clickers for presenters is going to be a little bit more simplified. Bob: [00:13:50] You know it’s just the… I haven’t yet hit the wrong button because I’m so paranoid. But again the odds of doing that making a mistake just because they wanted to add more features to it. Will: [00:13:59] Yeah. Well hopefully the forward and back or at least like a bigger or more pronounced or something. Bob: [00:14:04] I was just going to say that that you would think that they are gargantuan, like sort of the Fisher-Price version of like… No they’re not. Bob: [00:14:12] They’re a little bit bigger but not bigger enough to make it mistake free. Will: [00:14:17] So let me ask Bob your background is in marketing and that’s the focus of most of your listening efforts. Are there other disciplines or areas of a business that you think are particularly well-suited to put some of what you do into practice? Bob: [00:14:30] Yeah I mean so the definition of marketing in this example you know with my background… So if you look at marketing strategy as being if we can as profitably as we can sell something people need to the right audience, and do it in a repeatable way, then that has some components that relate back to this. You have to know what they need or what they what their problem is. And by the way that’s why you don’t that’s why you don’t ask people what do you need? You say you tell me about yourself. Tell me about your day. Tell me about your routine. Tell me where you get hung up. Tell me what you’d like to be doing better. So those are the kinds of things you would you would want to know. So that’s kind of marketing. Some people refer to it as marketing with a capital M. Other people think of marketing as just getting the word out. So Mr. or Ms chief marketing officer you need to get some more publicity you need to send out more emails. You need to do more webinars– whatever it is. So this helps with capital M and little m, and capital M includes products because you have to build something that’s that you believe you can sell at the right price. So I gave a workshop recently and it was great because I I actually listened and learned a few things. There were you know sort of the people– two folks of the seven or eight people in the room are chief operating officers, and it was a peer advisory group, and one of them said afterwards I think I can use this not for external customers alone, but for my internal customer. I said, as I’m want to do, I said What do you mean? Tell me more about that. Because I’m thinking well it’s another thing I can talk about. And he said Yeah I mean when I look at the questions that you that you recommend using and the listening approach, if I say to… you know if I’m a if I’m the head of marketing and sales is my internal customer, you know in part. So I can ask them a series of questions to understand what the world looks like from their perspective and either develop or fine tune the approach and the priorities we use to support that. But just the act of listening to an internal customer – doesn’t matter if it’s the CFO talking to customer support. What don’t you like about the billing system? You know it could be… so it could be omni directional emanating from any point in it inside of a company. The sort of internal listening to your internal customer. The other kind of use case that came out of it that one of the other participants was excited about was employees and prospective employees – listening to them. Just go in. Again we all start with our pitch. We’re a great place to work. We have all the benefits. We have a you know a charming comfortable work environment. We have a 401k. That’s great, but is that what people are looking for right off the bat? Well I read a millennial study that says I need it. That’s fine but go go listen to people you know. And so she was very excited about going and using the same kind of approach for employees, which makes sense for you know most of the businesses in this area are in some sort of talent war, you know depending on what they do and what type of people they need. There are just there are shortages of certain types of folks that so you have to invest in listening to that audience too to find out what they want. Will: [00:17:42] So let me ask… I won’t to ask you your view on all of the secret sauce here, but what are a few things you do with clients to really get to know their customers and their elevator rants? Interviews, lunches, Happy Hour, Amazon gift cards? Bob: [00:17:55] So there’s one giant approach that I use and recommend, and when I say giant I mean that there’s one sort of pillar of what I do, and it is a series of human-to-human conversations, by phone actually, and if one of us reminds each other I’ll come back to why by phone, that you know and sort of this one-on-one conversation. So it’s not an interview. It’s not a survey. But the person who’s asking the questions – let’s say it’s the CEO of a mid-sized company who just feels like can you know what we’ve kind of plateaued. We seem to sound the same as a lot of our competitors. I’m just going to go out– I heard this guy Bob London on this great podcast from 3pillar. I’m going to go do this. He or she is going to go just set up phone conversations with a minimum of five, but hopefully 10, decision makers that are either existing customers who know that company really well, or their prospects or suspects that are in the target audience. They fit the target profile but they don’t really don’t know much about the company. And that’s called a listening tour, or whatever you want to call it. I have to think of what to call it actually, but it’s a it’s it’s kind of a listening campaign. And the other thing… some of the other things you mentioned I mean I think it’s fine and great for companies to do surveys. Happy hours, which is you know something you mentioned on the list of things. That’s great. But I think that if you want to signal intentional listening, the best way to do it is in a one-on-one setting because then there’s no group effect, group think kind of group chat effect where people are you know there’s one strong personality or voice in the room who’s kind of overriding everybody else. The one-on-one aspect really gives people the feeling that not only am I listening, or that a CEO is listening, but that that there there’s an opportunity to to follow what they’re saying and go in the direction they want to go without any distractions interruptions. And I I really do feel like sometimes they are talking as though they’re in a confessional. I always joke that when I hear someone on the other end of the phone saying Hold on Bob, let me go close the door, I go into like my little touchdown celebration dance. You know that’s great because I know I’m going to get something – not that it’s private or proprietary, but that they’ve they’re… I imagine, and this goes back to the phone thing, they’re not sitting across from me wondering why I’m not making eye contact, I’m taking notes. They’re wondering you know are they obligated to validate my parking. You know it takes a lot of time to set up a face to face meeting, and it’s it comes with its own you know baggage and overhead. The phone, they’re alone, and they really do I think feel like, or I get the sense that they feel like that they are thinking hard. And part of that is the questions that are a little bit disruptive to their thought patterns that – you know you don’t ask typical questions like What keeps you up at night. You ask what’s on your whiteboard right now. Like what are the three things you and your team need to get done? And then they go alright well that’s a question I haven’t been asked before so I need to think about it. So just going back to your your original point. That’s what I preach is the series of one on one conversations. There are of course many ways to gather input, and I think a lot of them have… There’s another example and it’s not. It’s no less time consuming than the listening is go out and watch people use your product or service in action. What do I mean? And this is something I’m sure 3pillar does. I believe I’ve talked to folks here who do this. But look at what the users are doing. You know how much time are they spending on this particular set of you know functions or instructions, or are they skipping the feature that we thought was the big home run feature? You know just observe. You don’t even have to ask just observe. I’ve done that with clients on a sort of a webinars type thing where you let… you know as software as a service product and just give them the keys, give them some credentials to kind of a sandbox, and see what they do next. You know and that’s… And then in that instance you can at the end of it you say you know I noticed when you got to this decision tree you went this way instead of that way, or I noticed you spent like 60 seconds on this one page. Is there was there something there? You can get very rich insights that way as well. Bob: [00:22:27] Especialy in the product software product world. Will: [00:22:28] Sure. Yeah. Usertesting.com is a great resource that I’ve used a little bit on our Web site. You can ask people to try to find out what kind of company you are, or if you do mobile development work. You can feed them prompts basically and then see how long it takes them to accomplish a task and sometimes it’s eye opening… like man I was hope that was not how I was hoping would not take them two minutes to find our mobile development work. But anyway a good resource for folks out there. Bob: [00:22:56] If I could just add onto that for a moment. There’s a there’s a theme that I I see and I think we all would agree that we’re all in a tremendous hurry to get where where the product needs to be, or you know to hit hit quota. A lot of times it takes companies to get to a pretty painful place before they go yeah we’re willing to try this listening thing. I guess I make the point that human to human conversations… first of all it doesn’t take that long. I mean it’s it might be five to ten hour initiative between the time you start deciding who you’re going to talk to, complete the conversations, and look at what you’ve heard and kind of analyze it. But people perceive that it is a we don’t have time for that. Really? We don’t have time to find out what people really think about how their job works? Or we’ve done that already. Well how to do it? Well we talked to a few you know prospects who were in the target. OK. So I would just say that with with a little bit of investment and time and not much money at all, it can keep everything on the rails for months and years, instead of going off the rails very quickly. Will: [00:24:04] Yeah. And on that topic or on that front. Is there a frequency with which you recommend these things happen? You mentioned you know yeah we’ve done that. I’m thinking about us right. We’ve we’ve done some of these things. It’s been a while. It’s been a number of years. So how often do you need to do listening tours fort hose insights to remain viable. I’m sure it depends from company to company. Bob: [00:24:28] I mean I I think that every company, and I don’t expect this to happen, but I believe that every company should do it once a year, for no reason. And what I mean by no reason is don’t wait for there to be a problem. And you say well you know what. We’d better get out there again. Like when’s the last time we really asked people what’s going on in their world? Realistically, the process as I mentioned before usually starts because there’s a problem or an opportunity. Some companies go through they say well we’re going to rebrand. Like we’re we’re growing really fast and I had a services company like this that I mean they’ve been on the Inc 5000 list multiple times and they don’t have a problem with growth… but they felt like they wanted to become less of a collection of the partners and more of a brand branded entity, which would help them in marketing and recruiting and selling. That’s a trigger. You say well this is a great opportunity for us to go out and talk to people and find out what they think we do great; what they think we’re great at. So that we don’t end up sounding like all things to all people, and how does what we’re great at align with what their elevator rant is about consulting firms or services firms in general. But a lot of times companies wait till the point where it’s something showing up in the numbers and you know… But I would always say just because there was a problem with sales doesn’t mean there’s a problem in sales. I feel badly sometimes for salespeople that are hired and given nothing more than a really lame elevator pitch and some collateral that looks and feels just like the competitors, and they’re supposed to go out and just on their own charm and wits and hard work and who knows what else convince people to give their product or service a try. It’s really up to the CEO and marketing and the rest of the leadership team to kind of set a course that makes it easier to sell. Right. It shouldn’t be so difficult to sell and prospect and market. I mean in marketing we celebrate you know a 15 percent open rate on a campaign. And by the way a 1 percent or half percent click through rate. And so there are two problems with that. One is obviously you’re wasting money talking to the rest of them. And and then the 85 percent that didn’t open it? Some of them are annoyed like why am I getting this. You know it’s not relevant to me. And so the the the main purpose of this is to sharpen and optimize and maximize all the investments we make in our business to kind of get the word out… If we put out a more relevant message and a more relevant and kind of know more refined sharp value proposition. You know people perk up immediately, if it applies to them, and if it doesn’t apply to them they can quickly decide and you don’t waste three meetings trying to demo something in front of them that they’ll never buy. Will: [00:27:12] So let me ask you you mentioned whiteboards earlier. And we’re surrounded by white boards here 3pillar. Even in this very studio whiteboard walls. And for for him some of the writing and talks that you’ve done it sounds like you’re not necessarily a huge fan of white boards. So why do you recommend that sometimes people break out the lighter fluid and burn the white board? And as a follow up what are the five questions you think everyone should ask their customers? Bob: [00:27:39] Oh boy. First of all I don’t know what you’re referring to. Must be different Bob London. Bob: [00:27:44] No I use the white board as a metaphor for something that is corporate – not in a positive way corporate, as in yeah we’re kind of in our little ivory tower, number one. And number two, internal brainstorming. So whiteboards can be perfectly fine, but I’d I’d rather I’d rather be sitting with a customer or prospect with a white board. So when I’m when I’m talking about burn the White Board, which is the title of a talk that I give, the subtext of that is get out of the building and ask your customers and prospects these five questions. So it’s really a metaphor for don’t gather around the white board – get out and start talking to real humans. And so but but just to be clear I don’t want all the white board manufacturers and the what’s that horrible spray and that that you know those those markers… people that like to have whiteboarding… you say hey at 5:00 we’re having a brainstorming session at the White boardroom. Great. I think those people that call those are actually secretly addicted to the smell of the dry erase markers. That’s why they want to have so many white board meetings. So there there are questions and you know and I can repeat this at the end – but you mentioned something before in one of your questions I forgot to address. You said something about the secret. None of this is secret. It’s I’m out to change the world in some way where you know that more people embrace the concept of listening, which has the effect of reducing the noise level in the marketing and business world. So I’m open sourcing everything I do. So there’s an ebook on my web site: chieflisteningofficers.com/free, and there’s an ebook that talks gives all the questions, gives the listening approach, gives– the entire process is covered in there and it’s very short, and it doesn’t have a lot of fluff in it. It doesn’t have any fluff in it. Will: [00:29:36] Alright. The perfect end of marketing. Bob: [00:29:39] Haha. That’s right. So I mentioned one of the questions before that I like to start off with what, which is tell me what your priorities are for the next year to two. You know so in other words if you’re let’s say someone says OK we need three updates from you for the next board meeting or let’s say you’re meeting with the board… what is what are those high level things that the company is focused on not just your department but the company. And I guess again if they don’t have any relationship directly to the board you could say well tell me tell me what’s on your white board right now. You know another thing I’ve said is if I stop someone in the hall and ask them what they’re working on, it should fall into probably one of three big buckets in terms of mission and priorities. What should they be saying? So I have all these ways to come at it from the side and get them talking and thinking. And again the goal is not for them to give a survey answer. The goal is for them to think and say OK well here here it is. So that’s the first thing the second thing gets into. OK. For those three priorities for the organization at large what part of that do you own. What do you roll up to and what are you trying to accomplish. And then you get a sense of what the world looks like closer to their kind of you know. Right up right up in front of them. And then the next question is. OK great. Now what do you wish you were doing better in any of those areas. And that’s where you start to get into the you know what keeps you up at night pain point type thing, but in a way that is just much more conversational. And again speaking from experience of having about a thousand of these conversations with decision makers you know from Director of dev ops up to CEO. I had the pleasure of conversing with the CFO of the Carlyle Group you know a year ago or so, and all these people want to help so they end up talking a lot you know and revealing a lot. So then then you get into. So that’s kind of the level set about what their world looks like from their perspective. And you get into. So let me ask you does our industry have a reputation good or bad? They’ll say what do you mean. Well you know if you walk by a trade show booth or if you get a cold call from someone who’s in our industry, whether it’s us or not? And they again they will give you a pretty unvarnished view of what they really think because they don’t feel like they’re saying it about your company. They say they’re giving you an industry perspective. Now why is this important? Why do we want to open that Pandora’s box of you know what do you think of our industry? Because those perceptions and preconceived notions exist. Number one. So if it’s some if they say something and you’re guilty of it you have to fix it. Once you fix it though, more importantly, you have the opportunity to position yourself against the rest– What is disliked about the rest of the industry. This is a hugely powerful portion of the conversation because what you’re really finding out is hey instead of doing it like everyone else is doing it why don’t we think about doing this one thing differently? And by the way it happens to be the thing that people are annoyed with, and that that’s a formula for me again making marketing and selling a lot easier. Because if you lead with the thing that you do well that other companies don’t do or that do and is annoying, it just makes the conversation advance so much more quickly. The sales conversation. The greatest example of this that I’ve come across is in 2012 T-Mobile brought on a new chief executive named John Legere, not John Legend The singer but John Legere. And just in short the whole industry was talking about running hundreds of millions of dollars of ads on our network map is so great it covers ninety nine point eighty seven percent of Americans. And then there was another company AT&T and Verizon the company would say our network map covers ninety eight point two one percent, but it’s more dense in the urban area. Whatever they said. And you would think that that that’s what people were concerned about consumers – How did they choose a wireless carrier? Well it’s all about the map because if AT&T and Verizon are advertising that then it must be important. John Legere wouldn’t – He just didn’t assume that. He put on a headset and plugged into the T-Mobile customer support center and just listened to what people were really saying. And they did have a gigantic to use my term elevator rant. It had nothing to do with the network maps or call quality where T-Mobile was not strong. They hated contracts. In 2013, ’12, they hated being held hostage by wireless contract. So T-Mobile said, John Legere said, we’ve got to change that. And the people around him said why? Everyone does it that way. You can’t do away with contra– and that’s the point. If people hate what everyone does, do it differently. T-Mobile has been the most successful wireless carrier. They’re not the largest – They went from number four to number three, ahead of sprint – but they are the most profitable and successful in terms of customer acquisition and growth for the last five years. So it wasn’t just sort of a quick hitting hey we’ve got a bunch of customers by eliminating contracts. They they kind of upset the entire industry because once they did it the other carriers had to follow suit. And so they became just through listening just to listening… They became They became highly acutely aware of what people didn’t like about their industry and they changed they changed it. Will: [00:35:06] Yeah yeah. To great success. Bob: [00:35:08] Great success. So there is one more question I want to share with everyone that is – I refer to it as the killer question. The question is what would make you a customer for life? And customers and prospects are so taken aback by that, in a good way. First they almost universally say huh. That’s a that’s a good question. Which means that’s a signal that they’re going to think about the answer. And then sometimes I’ll add you know figured heavily or literally, what would make you a customer for life. But you know what they say? They say you know no one’s ever asked me that. That’s a that’s a good question no one’s ever asked me. And I I guess I I always use this opportunity to scold companies at large by saying you probably want customers for life, and here you are not asking decision makers what that looks like from their point of view. The beauty of the question is, and if I could only ask one this would be the one, customer for life. The beauty of the question is they start to think about filling in the gaps between the experience that they get and the experience that would that they’d really love. And that’s where some of the best insights come from. So if you could only ask one question, go out and say hey would make you a customer for life. Will: [00:36:24] Yeah. So one more question for you Bob, and then we’ll let you get put on that head scarf. It’s a beautiful fall day out there. Will: [00:36:31] Like most things in life, listening is a learned skill and it’s not one that many of us seem to excel at, in the era of social media where everyone has a megaphone. What are the critical listening elements you think are necessary for people to become excellent listeners? Bob: [00:36:47] That’s a really good question. I think that the mindset has a couple of components to it before– Like if you’re not going to have this following mindset, don’t even bother going out and listening. So try to remove your biases. You may not be able to remove them before the call, because you don’t know when they’re going to kick in, but you have to be aware during these calls that, if something kicks in, you have to resist the urge– just take notes on what you’re hearing and drill down on it. Don’t skip something or push back on someone because someone says well here’s the issue we really have, and don’t say that you you would never say of course what we’ve tried to fix and it’s really hard. I mean you don’t owe them any answers at that point. You’re just trying to hear them though. Bob: [00:37:35] The authenticity and curiosity aspects are critical. What do I mean? I’m fortunate. I’m I guess a curious person. And so I have questions and I you know I like to listen to the answers. I’m not asking the question just to get to my next question. And I think if if if the curiosity piece is there, and if you can get into that mindset like I really want to know I’m not just asking. Yeah I want to grow my business but I’m asking because I really want to know what’s going on on the other side of that wall of noise. So the curiosity. Authenticity. What does that mean? It means that you’re not, and I heard this the other day, that you’re not just asking to get the questions out of the way so you can open up your PowerPoint and start pitching someone. The authenticity, and this is I think why – so there’s an e-mail template that’s on my web site as well that I’ve used to invite people to participate in this process, and about 80 percent of the people who get the e-mail end up doing the conversation. Why? Because the e-mail is authentic. It doesn’t it doesn’t try to sound like a marketing thing. It just says you know what things are going well here, but we’re trying to kind of live this ethos that you know we never know everything there is to know and so we’d love to talk to you just as a human being and as a customer to find out what the world looks like from your perspective. So things will keep going well here. And there’s something about it that comes across as authentic. And I think the last thing is just the unfiltered nature of these conversations. That’s why my my dream would be that every CEO does this because there are a lot of layers between if you assign it to someone. There are layers, filters, potential biases, resentment that could be in the mix because someone is asked to do this, as opposed to the CEO who has the most to gain or lose by not doing it. And because if you look at the job John Legere example, he could have… I mean it would have been totally acceptable and normal for him to assign to the chief marketing officer. I want you to go listen to these calls and tell us what you hear. That Chief Officer might have delegated it to a director of something or other. You know or maybe they had someone in charge of voice of the customer who… with all due respect to that, I mean that’s a very important role, but it has limited impact and authority. So the unfiltered nature of this I think is really important. Asking open ended questions, let people go where they want to go in the conversation. So you can drill down and maybe redirect a little bit, but you don’t… you certainly never correct them and you don’t interrupt them to make your point. So those are the kinds of things you have to do. It’s really the opposite of a sales conversation in some ways because you never get to the thing you’re pitching. You never get to it. You may be tempted but you can’t go there. You cannot go there. It poisons the entire process. Will: [00:40:27] Well so you won’t sell it but I will: ChiefListeningOfficers.com is the Web site where folks can go they can find a free ebook. Many of the videos, blog posts. Anywhere else people should be looking out for you? Bob: [00:40:39] I do. I’m doing more speaking and talking a lot of which is that here in the Washington D.C. area. But spreading out a little bit. You know I’m really evangelizing. I’m investing a lot of time to let people know how important this is, and I’m, as I said, because I’m open sourcing it, whether they hire me or not is beside the point. It’s really to get this message into the hearts and minds of as many people as possible so they can I guess really just kind of stop making so much noise before they’ve listened to what’s really important. Will: [00:41:08] Yeah. Very nice. Well it’s an important mission. Thank you for sharing it with us today. Thanks for coming in. Bob: [00:41:12] Thanks for having me. This is really cool. Thank you. Will: [00:41:14] Absolutely. Our pleasure.